The Bellini was built in 1864, shortly after the unification of Italy, at the expense of Nicola Lacapra Sabelli and was designed by the architect, Carlo Sorgente. It was part of the general plan to modernize the urban area between the National Museum and the music conservatory along what had once been the old west wall of the city. That modernization happened in the late 1800s and, besides the Bellini theater, included the new Galleria Principe di Napoli and the Royal Academy of Art. The Bellini held 1200 spectators and at first hosted a variety of events, from circuses to musical comedy to an occasional opera. A few years later, Sabelli's tastes went upscale and he decided to have the theater rebuilt along the lines of the Opéra-Comique in Paris and make the theater primarily a venue for opera. The theater reopened in the autumn of 1878 with a presentation of I Puritani by Vincenzo Bellini, for whom the theater was named. The theater enjoyed a long period of success, missing the fate of theaters that had either closed in the face of competition from popular entertainment such as vaudeville and cinema or had, themselves, converted to venues for such entertainment. 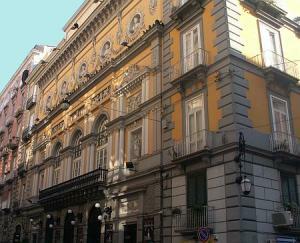 Decline set in after WWII and the Bellini staged its final production in 1962. The next year it was turned into a cinema and acquired a well-deserved seedy reputation. In 1986 the Bellini was acquired by Neapolitan actor Tato Russo (b. 1947) as a venue for his own theatrical troupe. They opened in 1988 with a staging of Brecht’s The Three-Penny Opera. The company has since that time generally enjoyed success; currently they are staging Pirandello’s Enrico IV [Henry IV]. Besides plays, the company also performs modern musicals (using the English term "musical" to describe the works, such as Russo's own work, Masaniello, based on the protagonist of the 1647 revolution in Naples. There is a common perception that fewer people go out to see plays than used to. If that is so, then the causes are probably a combination of changing tastes and increasing competition from other types of entertainment. To the extent that it is NOT so, it may be because those who like to see live theater are not going to be drawn away by a film, for example. They may be two different audiences, at least to some degree. It is hard to glean much useful knowledge from statistics. For example, Italian statistics on entertainment generally group together all “live box-office” events and then break it down further. Thus, in a recent year (2007) we find that there were 207,000 live events in Italy—i.e. theater, opera, all concerts of every kind of music, ballet, circuses, etc. All of them together sold 36 million tickets. (That number is actually up from 28 million in the year 2000). Of that, almost half of ticket sales were for live theater, plays such as those presented at the Bellini Theater. (By comparison, in the year 2006 there were 105 million tickets sold for cinema.) Yet, I have not seen a survey on how many people don’t go to see a play because they go to see or do something else. There does seem to be a regular theater-going public in Naples, and the comeback of the Bellini Theater (and a few others) demonstrates that. True, the Bellini no longer puts on the kind of event it was designed for —opera— but it has returned to the world of fine live entertainment and has done well.